Whether you take a creative approach towards the digital marketing project or go down the most mundane path; it all comes down to the approval of the client, especially in the case if you are working for any digital marketing agency or you are a freelancer. Nevertheless, you still have to execute a worthy marketing project that is complete and receives praise. Accomplishing a digital marketing project is not an easy feat. A lot of care and effort go into it which is why it is important that you undertake certain steps that will make your project a success! So, here are some of the ways that could turn your digital marketing project into a masterpiece! First things first! Start with a draft because without one there are chances of you forgetting some crucial things. Therefore, get a paper and pencil and create a template of how you will approach the marketing project. When you are done with that, go over the template again with new ideas and change the bits you do not like. The point is having a template which is the most important step when it comes to formulating any project. Also, a template helps in categorizing information and keeps your focus on the areas where it is needed the most. You can follow the IPEMC methodology (Initiating, Planning, Executing, Monitoring, and Closing) while creating a plan. Keep in mind that the success of your project depends on how well you have planned it. So, keep a checklist, plan well, and eliminate confusion by sticking to your template. This strategy is pretty self-explanatory. To ensure that your digital marketing project is a success, you need to incorporate elements that are not just trending but also add value to your entire campaign. That said, the manipulation of certain SEO tools also work towards ensuring the favorable outcomes in regards to your project. Because of this, it is mandatory to gain information about Google’s ever-changing algorithms so that you can create a successful project well within the stated boundaries. In a digital marketing project, goals and expectations go hand in hand because without understanding what is expected from you, you cannot have clear goals. For instance, if your client’s goal is to get more online traffic, what they really want is an increase in sales or more leads on their website. So peel back the layers, ask tons of questions, and understand the goals and expectations. Only then will you be able to have a digital marketing project that hits the mark! Before you jump into executing your project, you need to set criteria against which you can measure the overall success of your campaign. More often than not, marketers need to know how well their campaign has performed or whether their attempts have been fruitful or not. In such cases, performance metrics save the day by providing marketers with enough data which they can use to decide whether their efforts were worth it or not! Visual elements and great content are two of the things that can make or break your marketing campaign. Because of its importance, it is always better to seek out professional help as they are better trained to handle situations that start to go awry. That said, you can also utilize your in-house designing team if they can manage it. How well you capture the attention of the users, can determine the success of your campaign. With great visual content and elements, you can achieve just that! 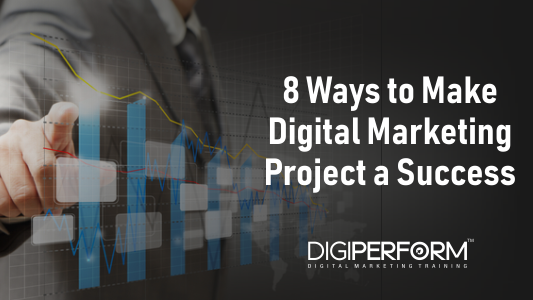 Taking on a digital marketing project with a budget in mind is the safest way to go. Also, knowing your resources and deciding on a budget beforehand will keep you safe from running out of money mid-project. To maximize your chances of creating a winning project, you also need to analyze your resources. This is important since it will help you realize whether you or your team have the required money, skills and time to complete any specific marketing project. Figuring out all this information beforehand will ensure the smooth and steady flow of your project. Learn to work smarter not harder! So in keeping up with this famous saying, you should divide your entire marketing project into smaller tasks. Those tasks can be distributed evenly among your assigned team. Dividing the project not only reduces the burden but it also quickens the time pace since multiple people would be working on it. So to find your way around this step, gather your team and let them pick out the pieces they want to work on. Then, get time estimates for each task and push your team harder so that they make it well before the deadline. To ensure that no one is slacking when it comes to the digital marketing project, you need to check the progress of the project on a daily basis. Additionally, try to work out with teams that are struggling with their tasks and offer advice to help them pick up a pace. Also, there are various online software programs that can help you review the project’s progress. With the help of such tools, you can keep a track of all the tasks, set up deadlines, create guidelines, and assign new tasks. A great part of a successful marketing project depends on how well you have done your research. Marketers with a successful streak of marketing campaigns are extremely analytical who form well-calculated decisions based on data. Although you can achieve a successful digital marketing project by following the above-mentioned ways. However, a project that is based on research and data can provide you with a solid foundation that can help you with not one but many other marketing projects to come. To help you gather sufficient data quickly, you should invest in outdoor cat5e cable since they are designed to provide quick speed and reliable connection. Lastly, not two marketing firms are alike so you are free to manipulate and edit the ways mentioned-above according to the needs of your project. The results will vary but at the end, you will end up with a marketing project that will be successful! Shawn mike provides ghostwriting and copywriting services. His educational background in the technical field and business studies helps him in tackling topics ranging from career and business productivity to web development and digital marketing. He occasionally writes articles for Shireen Inc.
Chapter 3 – how to create a free email template without coding?